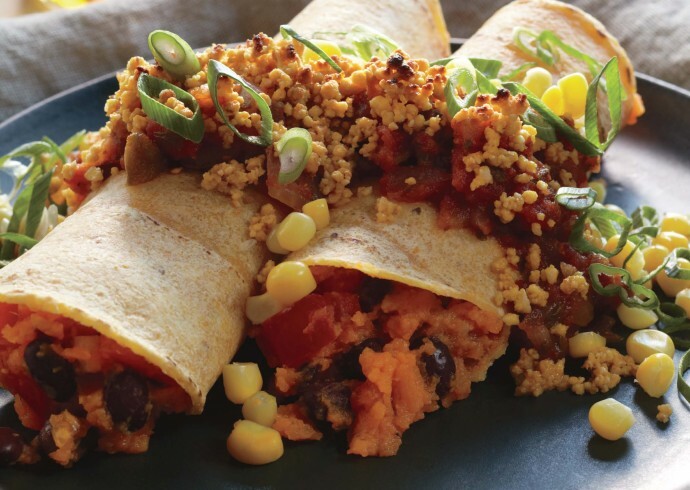 Clean Food Chef Terry Walters Shares A Secret Recipe: Sweet Potato & Black Bean Burritos with Cashew Cheese! Chef Terry Walters at the farmers market. 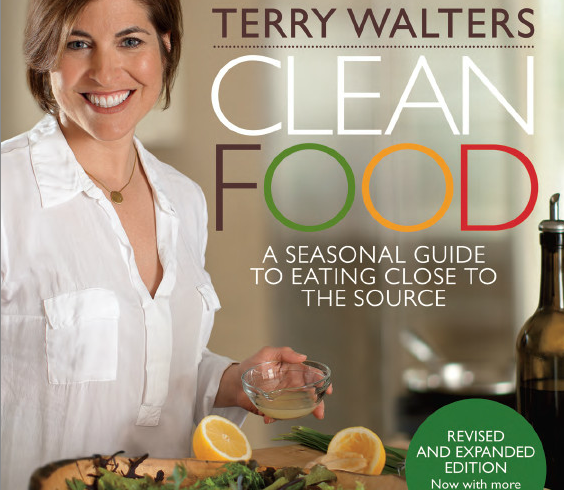 Terry Walters, author of the highly-acclaimed and bestselling books CLEAN FOOD and CLEAN START, is at the forefront of the clean eating lifestyle movement. A James Beard Foundation Award finalist and recipient of the Nautilus Gold Book Award, Terry is dedicated to making the path to good health both easy and delicious. Terry shares her passion for eating clean and living well, inspiring and empowering us to make positive changes for our health and our environment. The ultimate in healthy eating and cooking, CLEAN FOOD: A Seasonal Guide to Eating Close To The Source, is Terry’s revised and expanded edition of her popular first book, and offers lovers of fresh, seasonal fare even more recipes and inspiration than before. 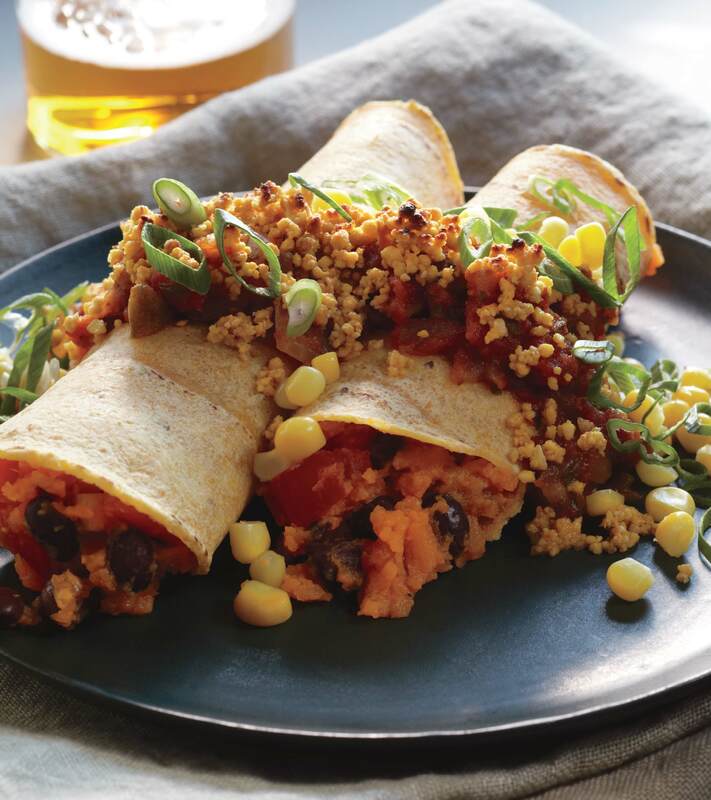 In addition to all-new color photography throughout and more than 20 new recipes, Terry has updated the dishes to feature today’s most healthful ingredients, has included variations to make every recipe gluten-free, and has added a new chapter dedicated to clean snacking. Renowned chef Mario Batali says: “CLEAN FOOD is the most exciting book based on fresh produce and simple recipes I have used in years”. WOW!! Now that’s an endorsement! 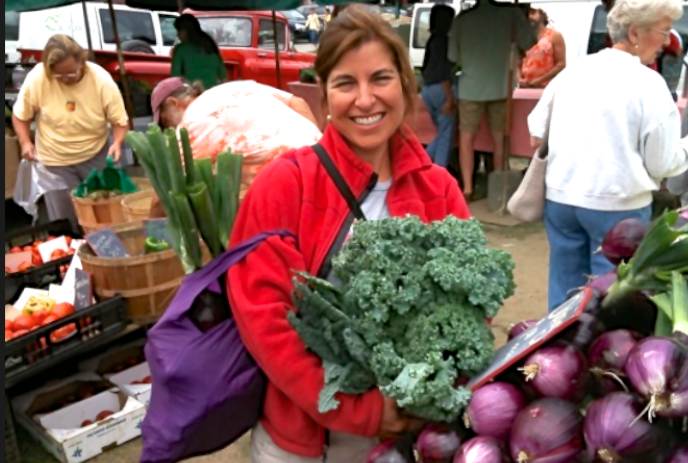 Terry travels throughout the United States promoting her nourishing lifestyle. She has been featured on television, radio, print and Internet media and is the author of the popular blog, Eat Clean Live Well. And, she serves as an Advisor to the Board of Directors for Urban Oaks Organic Farm, one of the largest urban organic farms in the country. 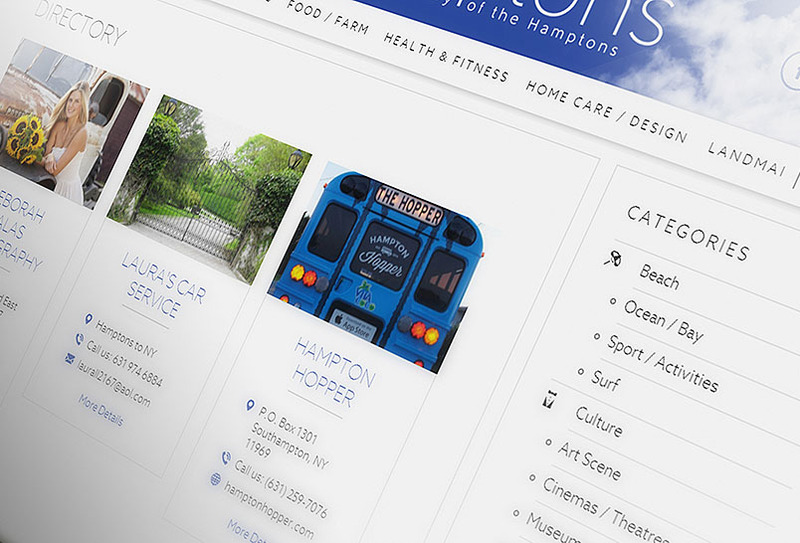 Terry resides in Connecticut with her husband and two children, where you are likely to find her running, cycling, skiing, gardening or on her way to any one of many local organic farms or farmers markets! 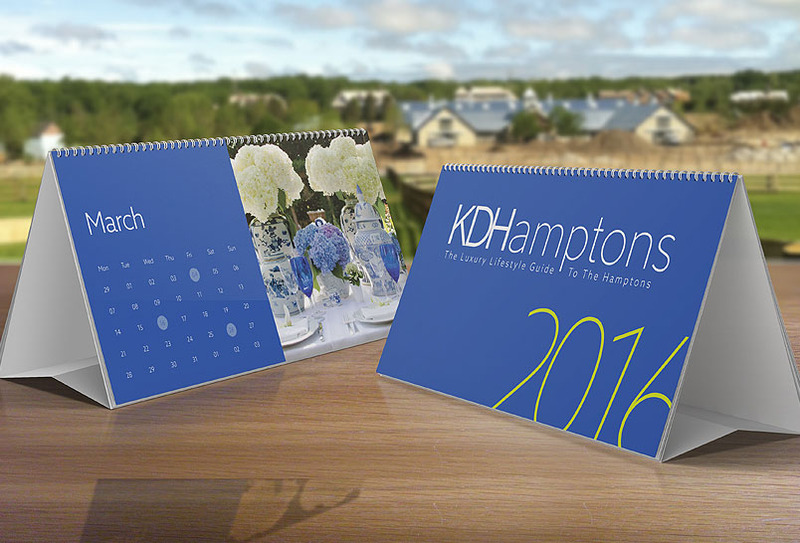 KDH loves this cookbook, which is a perfect fit for Hamptonites who love to cook with a “farm-to-table” philosophy. Try these two recipes at home and you will receive your own rave reviews! Place sweet potatoes on baking sheet or foil and bake 45 minutes or until soft. Remove from oven and cool. In food processor, grind cashews to a fine meal. Add nutritional yeast and process briefly to combine. Add oil and process until you have a moist meal (do not overprocess or meal will become dough-like). Set aside. Set oven to broil. Place corn in strainer. Bring 1 cup water to boil and pour over corn to blanch or thaw. Peel sweet potatoes and mash with lime juice. Fold in black beans, onion and tomato. Spoon filling into center of each tortilla, roll up and place, seam side down in shallow casserole. Spoon salsa over top and broil 3 minutes. Remove from broiler, top with cashew cheese and corn and broil 2 more minutes, watching closely to keep cheese from burning. Remove from broiler, top with chopped scallions and serve. Terry shares, “LET’S FACE IT – WE ALL HAVE CRAVINGS we simply can’t deny! Preheat oven to 350°F. Lightly oil an 11-inch tart pan. Combine pecans, rice flour, cacao and salt in food processor to make a crumb-like mixture. Add oil and syrup and process to form a moist ball. Place ball in tart pan and press to form crust. Pierce several times with a fork and bake 15 minutes or until lightly browned. Remove from oven and set on wire rack to cool completely. Whip tofu in food processor until smooth. Add cashew butter, syrup, vanilla and salt and process until well combined. In small pan over low heat, melt chocolate chips, then add to food processor and blend until combined. 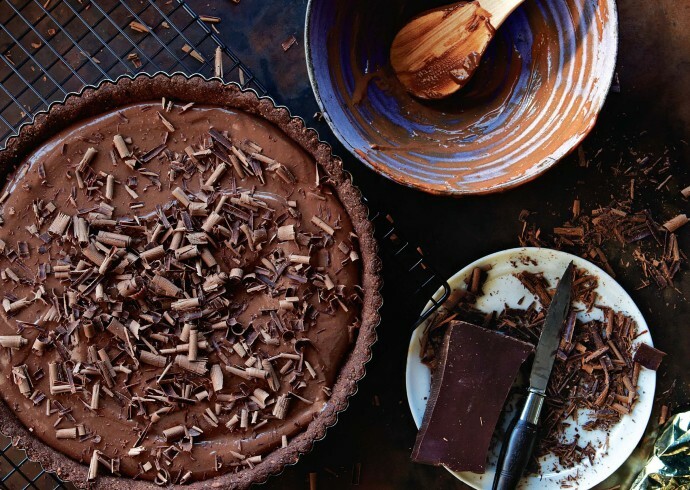 Pour chocolate mixture into tart shell, smooth top with spatula and refrigerate at least 30 minutes. 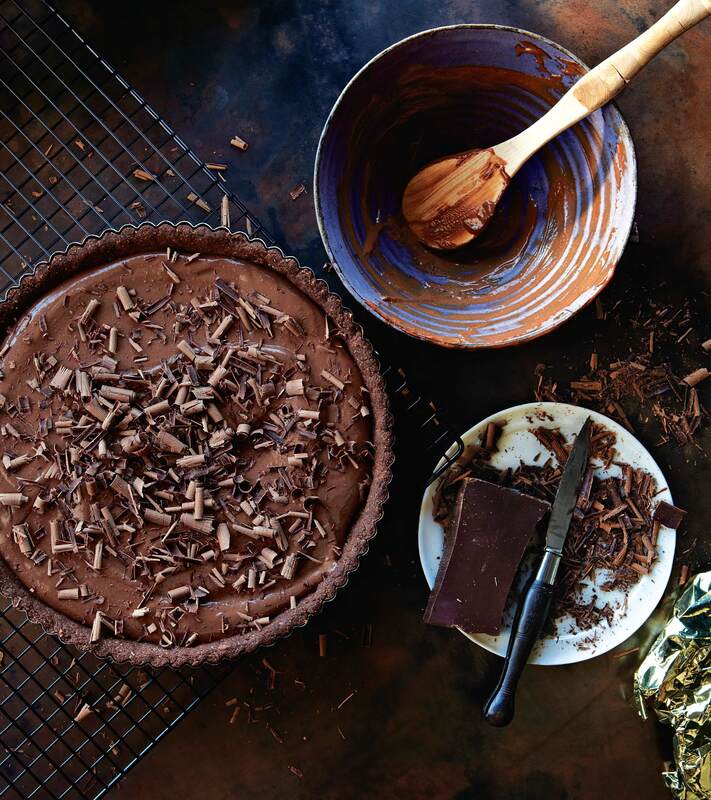 With a sturdy chef ’s knife, shave chocolate from block, spread evenly over tart and serve.